I hadn't actually meant to post the folded knit hem tape info in 2 parts, but I realized earlier today that I'd never posted the final picture for yesterday's post about making the folded knit hem tape! So if you were wondering what the tape looks like when it's actually sewn to a garment, this is it. The tape is sewn to the sweater or other garment with all raw edges together. The seam allowance is steamed toward the tape. In this case, I also stitched the seam allowance to the tape with a 3-step zigzag. In the picture above the hem is turned, steamed, and ready to be sewn by hand or machine. 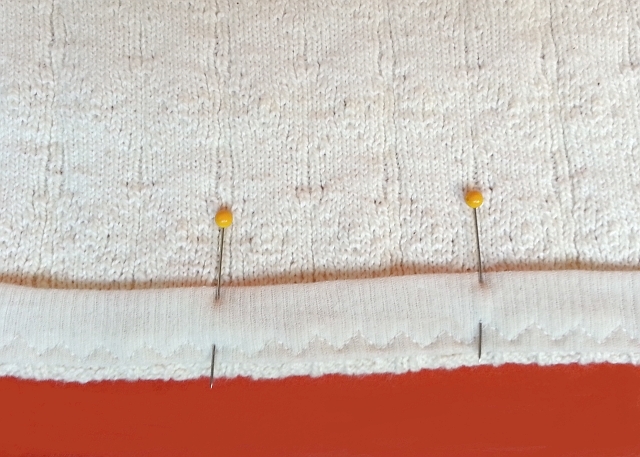 As I said in the original post, the permanently folded tape edge makes a nice reliable edge for sewing hems on sweater knits by hand or machine.